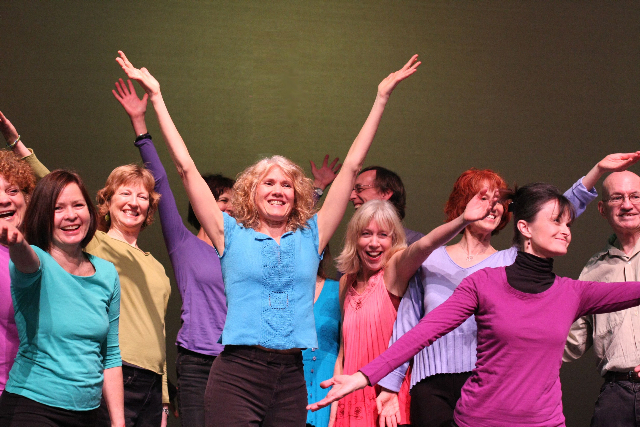 I am pleased to introduce Hand Me Down: Bestowing Our True Inheritance through Life, Lessons and Legacy, a production of Barrie Barton’s Community Choreography, taking take place at the Diana Wortham Theatre on Friday, April 15th and Saturday, April 16th, 2011. A portion of the proceeds will be donated to the Bereavement Center at CarePartners Hospice and Pallative Care. The theme for the show was inspired after Barton left her job of 22 years, working as a dance teacher with Buncombe County Schools, and after she turned 50. “It seemed like a time to look at what I had contributed to my community,” she says, reflecting on the thought that set her fourth community production into motion. Working closely with a cast of 16 — with actors ranging from age 34 to 64 — Barton asked everyone to consider a set of questions: Where do you come from? What is home? What do you carry through this world? What do you hope to leave behind? From here, a community dialogue was sparked — providing a foundation for the production as a whole. Creating an original score as a team, and thinking deeply about these questions, however, is no easy task. For the past seven months, the cast has been hard at work examining these ideas through creative writing, conversation and free-form movement, trimming material down as they go and pairing it with expressive dance and spoken-word/prose poetry. 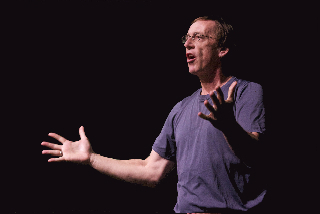 Join Community Choreography for an exceptional evening of colorful dance, uplifting music, engaging story- telling and comedic skits in the community performance of Hand Me Down, Bestowing Our True Inheritance Through Life, Lessons and Legacy directed by Barrie Barton. Plan to attend, Friday, April 15 and Saturday, April 16 at The Diana Wortham Theatre, 7:30 pm. Tickets are $15 and are available at The Enchanted Forrest, Malaprop’s Bookstore and Diana Wortham Theatre. For more information; 828 6581217. The cast and crew invite you to experience a spicy, eclectic blend of real-life stories with physically expressive choreography that are both humorous and deeply engaging. Join with them as they unfold their lives and experiences in ways that are certain to be provocative, entertaining and promise to make real the humanity we all share: truly community at it finest. Hand Me Down is combination of multimedia, movement theater, poetry, music, and stories created in a spirit of collaboration between the dancers and the choreographer. The cast includes more than 50 members from Asheville and the surrounding area. The dancers say they have drawn inspiration from their own life stories and have chosen them to share those with the audience. The result is a passionate and poignant interpretation of a universal message. CCP invites participants to engage in artful play, imaginative exploration, and spontaneous expression through movement, stories, creative writing, and choreography. Each project is motivated and inspired by particular themes from the participants’ lives. Through the production, their collective stories emerge and are interpreted through movement, music, and voice. Community Choreography & Jubilee Ask- What is Your Legacy? Hand Me Down, Bestowing Our True Inheritance Through Life, Lessons and Legacy is an evening of multimedia, movement theater, music, and story inviting you to genuinely delve into the compelling complexities and joyous reminiscences of our home and the legacy we receive from those before us and to those who follow. Based on the lives of 38 community members, choreographer Barrie Barton distills the collection of stories and movements into a passionate and poignant interpretation that conveys a universal message. 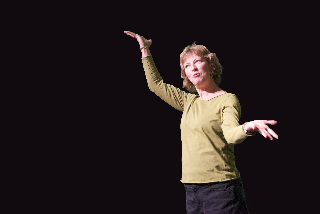 With 3 highly successful keynote performances from 2006 -2009 reaching over 1000 audience members, Barrie presents her fourth Community Choreography Project – Hand Me Down: Bestowing Our True Inheritance Through Life, Lessons and Legacy. The word Legacy will be milling, muddling and meandering through the halls of Jubilee in the coming months, which is where the rehearsals for Hand Me Down take place. Collaboration between Jubilee Community and Hand Me Down, Bestowing our True Inheritance Through Life, Lessons and Legacy (see there’s that word already) is afoot. For the month of March, the Hospitality room of Jubilee features photography by Paul Howey and Doc Klein of rehearsals for Hand Me Down. The photography show features two co-created pieces developed by choreographer Barrie Barton: There’s No Place Like Home and From that I am; From this I live. Both pieces examine the ordinary moments and memories of our sense of place and how we view our contributions to this life. Jubilee is located at 46 Wall Street, Asheville NC 28801, Phone: 828-252-5335. JUBILEE! asks– WHAT IS YOUR LEGACY?